this ornate, Italian style theatre is host to West End musicals of note. Come From Away tickets are now available for the Phoenix Theatre run starring Rachel Tucker. We strongly recommend using public transportation to get to the Phoenix Theatre. The nearest underground station is Tottenham Court Road (Northern/Central Lines)- use the Cross Rd. Exit. The theatre is also serviced by bus line 19, 22, 24, 40, and 176 at Charing Cross Road. If you are driving to the theatre there nearest car parks are the Great Russel Street Car Park and the Newport Place Chinatown Car Parks. The Phoenix Theatre is a London West End theatre which opened in 1930 with the premiere of Noel Coward's Private Lives. The show featured Coward himself in the cast, along with Gertrude Lawrence, Adrienne Allen and a young Laurence Olivier. The entrance of The Phoenix Theatre is on the corner of Charing Cross Road and Flitcroft Street with a four-column rotunda above the canopy topped by an attic with square windows. Noel Coward formed a strong association with The Phoenix, returning with Gertrude Lawrence as his co-star in 1936 with the programme of the one-act play "Tonight at 8.30". He returned again in 1952 with Quadrille, which opened only a few days after the death of Gertie Lawrence, and Coward wrote how difficult it was to sit through that first night in what he and Gertie had always referred to as "our theatre". The Phoenix Theatre enjoyed a succession of very successful plays including John Gielgud's "Love for Love" during the war, and a season featuring Paul Scofield and Peter Brook in the mid fifties. Canterbury Tales, adapted from Chaucer's famous book opened in 1968 and began a 2000 performance run. The eighties and nineties saw many award-winning musicals, including "The Baker's Wife" by Stephen Schwarz (directed by Trevor Nunn) and the delightful "Into the Wood" by Stephen Sondheim starring Julia McEnzie; as well as a very successful season of Shakespeare plays. The production Blood Brothers, a musical by Willy Russell, which transferred from the Albery in 1991, was the longest running show ever at The Phoenix Theatre. One of the most beautiful theatres in London's West End, the Phoenix theatre opened in 1930 and was beautifully designed by Giles Gilbert Scott, Bertie Crewe and Cecil Masey, with Theodore Komisarjevsky as Art Director. A change of ownership in 1966 led to a refurbishment programme, including the construction of the Noel Coward bar in the Phoenix Street foyer, which was opened by the great man himself in 1969. Respecting the tradition of the Italian theatres, the auditorium shines with golden engravings, and red seats, carpets and curtains. Above the boxes are panels by Vladimir Polunin of Tintoretto, Titian and Giorgione, and the entire safety curtain is a rendition of Jacopo del Sellaio's The Triumph Of Love. Also, throughout the building, you can enjoy the sculpted wooden doors and the decorated ceilings. 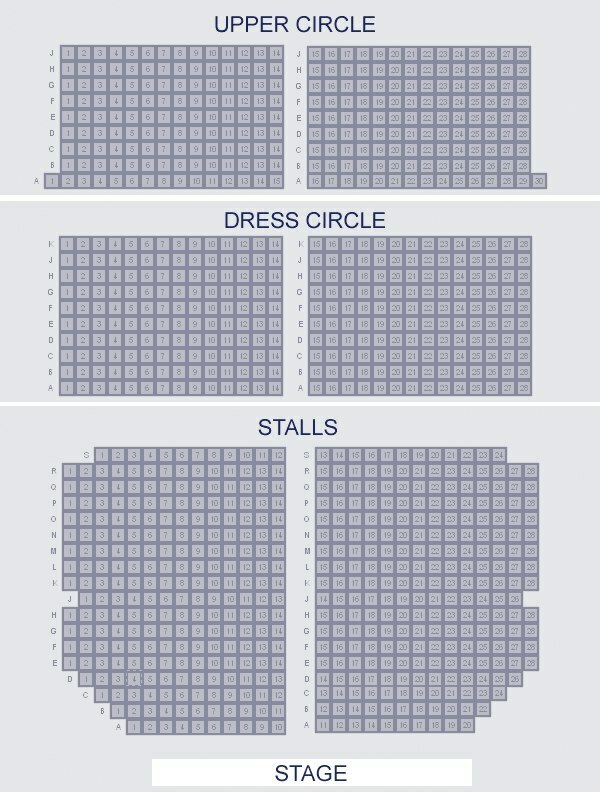 The Phoenix Theatre has a capacity of 1,012 across 3 levels: Stalls, Dress Circle, and Grand Circle.